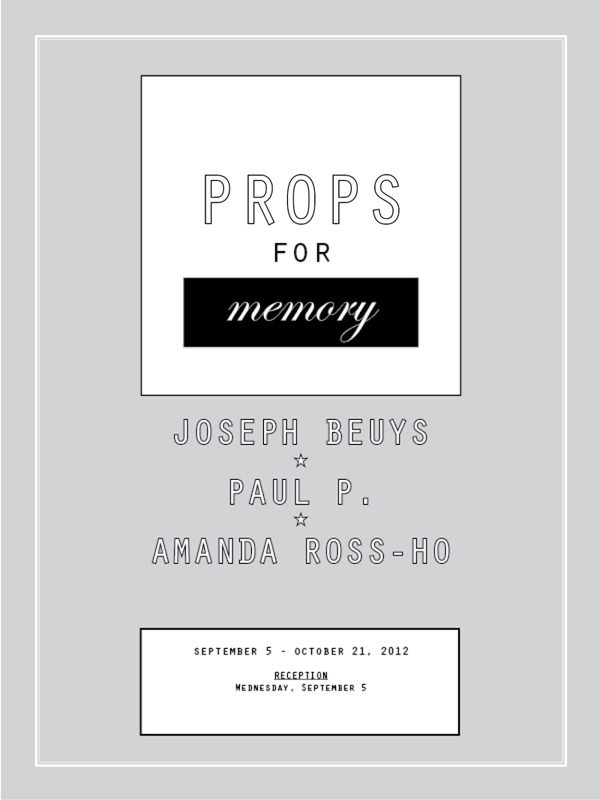 INVISIBLE-EXPORTS is pleased to present Props For Memory, a group exhibition featuring work by Joseph Beuys, Paul P., and Amanda Ross-Ho. Snapshots, as much as they are invariably pictures of subjects, are also inevitably studies of moments and tours of memory—portraits in, of, and by time. Often they merely masquerade as monuments, when in fact they are variegated, sometimes mournful, often sublimated tributes to ephemerality—ephemerality of experience and of youth; of focus, vision, practice, and work; even of subject-ness and object-ness. The work of the three artists presented here addresses the problem of time raised by the failures of memory—the false promise of total recall and the failure of even the most savantish memory, or the deepest archive, to truly preserve. The two living artists, Paris-based painter Paul P. and Los Angeles multimedia artist Amanda Ross-Ho, each present portraits of moments otherwise destined to be forgotten, portraits that encode a kind of ambivalence about the project of remembering or preserving itself—snapshots of moments clouded by indeterminancy, vagueness, fantasy, and flux. In Paul P.’s work, a new series of oil landscapes, plein air sketches become semi-abstract studio portraits of half-remembered, half-reinvented impressions; Amanda Ross-Ho’s sculptures are pieced-together studio time-capsules, clipped portions of peg-board on which she mounts a constantly-rotating collection of source materials, removed at almost random moments to create portraits of an idiosyncratic, induced-chaos working process that never stands this still. Beuys, whose Economic Value work is included as a kind of forebear, addresses the problem in a more innocent way—by assembling a Potemkin grocery store, filled with bygone products he remembered keenly from his own postwar childhood, as a kind of record, of his own inner life as a pre-teen commodity fetishist, understandable only to him and, therefore, doomed to decay. Joseph Beuys (b. 1921) was a German Fluxus, Happening, and performance artist. His work has been exhibited extensively, including the Guggenheim Museum, New York; the Venice Biennale; the Tate Modern, London; the Seibu-Museum, Tokyo; The Museum of Modern Art, New York; the National Gallery of Victoria, Melbourne; among many others. Born in Canada in 1977, Paul P.’s recent solo shows include Daniel Reich Gallery, New York (2010), Massimo Minini, Brescia (2011), Maureen Paley, London, 2008, and the Power Plant, Toronto (20007). Recent group shows include, Freud Museum, London (2011), The Art on Paper Biennial, Weatherspoon Art Museum (2010), Compass in Hand, MoMA (2009). His work is in the collections of MoMA, SFMoMA, the Brooklyn Museum, The Speed Museum and the Art Gallery of Ontario. Paul P. currently is based in Paris. Amanda Ross-Ho (b. 1975, Chicago) is a Los Angeles-based artist who received her MFA from the University of Southern California in 2006 and her BFA from the Art Institute of Chicago in 1998. Her work has been included in New Photography at The Museum of Modern Art (2010); Image Transfer: Pictures in a Remix Culture at the Henry Art Gallery (2010); and was the subject of a solo exhibition at the Pomona College Museum of Art titled Amanda Ross-Ho: The Cheshire Cat Principle (2010). Her work was also included in the Whitney Biennial (2008) and the Orange County Biennial (2008). A solo-exhibition of her work AMANDA ROSS-HO: TEENY TINY WOMAN, is currently on view at the Museum of Contemporary Art, Los Angeles, through September 23, 2012.